← Can You Solve This Math Logic Problem? I found it ironic, though, that immediately afterwards, your own writing contained a glaring punctuation error. As a writer myself, I know how hard it is to overlook a simple mistake, so I chalked that one up to poor proofreading. The same mistake happened again a few words later, and then again! You should always place commas and periods inside quotation marks, not outside. If you happen to be from across the pond, you may be used to the rules of British usage, which does place these marks outside the quote marks. Here in the US, though, the proper form is to place your punctuation inside the quotes. If this were my writing, I would certainly want the chance to correct it before some ugly troll called me out for it. I certainly didn’t want to make a public comment, so I thought an email might be a nicer approach. Anyway, thanks for the obvious time and effort you put into your website. I can’t wait to read further back in your archives to see what sort of wisdom I can gain. I promise I’m not editing your work as I read….any more! And I do hope you receive this message in the spirit in which it was intended. When I first read her email, I wasn’t sure if Stephanie was actually correct. I’ve always thought that if punctuation was part of the quote, it should go inside the quote, but if it was not part of the quoted material, such as the example in my blog post that Stephanie pointed out, then the punctuation should go outside of the quote. After reading Stephanie’s email, I did a little research and found out Stephanie is correct, and I am wrong (or I should move to England). 1. When dealing with periods and commas, the convention in America is to always put the period or comma inside the quotation mark, as Stephanie points out. The convention for British writers is to place the period or comma inside or outside the quotation mark depending on whether or not it is part of the quotation. I’ve got to say the British convention makes more sense to me. 2. When dealing with question marks and explanation points, both the American and British convention is to place the question mark or explanation point inside or outside the quotation mark depending on whether or not it is part of the quotation. 3. When dealing with colons and semicolons, both the American and British convention is to always place the colon or semicolon outside of the quotation marks. So the only place the American and British conventions differ is in the treatment of periods and commas, where the American convention is to always put the period or comma inside of the quotes (whether it is part of the quoted material or not), where as the British convention is to put the period or comma where it belongs (I think you can guess which convention makes more sense to me). Bottom line: I learned something new, and I really appreciate Stephanie pointing it out. Few people take the time to comment on a blog post, and even fewer people take the time to write the blogger a personal email. Stephanie is a rare bird. I guess my “unconventional” use of periods outside of quotes must be a pet grammar peeve for her. 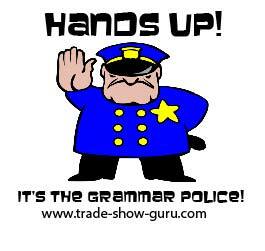 I understand pet grammar peeves, and how they can really get under your skin. In my case, it irritates me how often I see people on forum posts and blog comments who mix up the words there, their, and they’re. Did these people sleep through their elementary and high school English classes? However, my biggest pet grammar peeve is the incorrect and/or excessive use of the word “like.” Not only do I notice it with my kids and their friends, but also among adults. like: having the same characteristics or qualities as; similar to. I regularly hear people use the word “like” incorrectly, for example, they will say “a slice costs like $3″ when they should either same “a slice costs about $3″ or simply “a slice costs $3”. It is either $3 or about $3, but it’s not similar to or having the same characteristics as $3. Even more so, many people repeatedly use the word “like” as an unnecessary filler word. I swear that for one of my teenage daughter’s friends, every fifth word (or more) she says is “like.” I’m not sure if she has ever completed saying a sentence without saying “like” in it. Fortunately, my two kids don’t use the word “like” as much as most of their friends, but they still use it a lot, both incorrectly and unnecessarily. My wife and I remind our kids several times a day to not say “like” so much, but so far it is a habit that we just can’t seem to break. It drives me crazy. So I think I understand Stephanie. Certain things get under your skin. I appreciate Stephanie’s email, and hope this blog post may spread the word and teach a few others the correct place to put periods and commas when using quotations marks. I just wish I could get Stephanie to show up at our house and get my kids to stop saying “like” so much!